LONDON: A British-Pakistani taxi driver who took taxi giant Uber to court and won has said he is “humbled” and thankful that he was able to take on the world’s largest taxi firm. Yaseen Aslam, from High Wycombe, was one of two drivers who brought an employment case against Uber on behalf of a group of 19 of its workers, who argued they were employed as limb b workers by the firm rather than being self-employed. 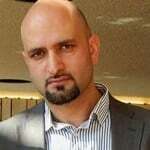 In an interview with this correspondent, Yaseen Aslam, whose parents migrated from Azad Kashmir District Mirpur to Britain as a labourer from Pakistan, said he took up the case against Uber with the help from his trade union - IWGB trade union which represent precarious low paid workers who had faith in him and provided him offer of legal team against the multi-billion dollars taxi giant which employed over a dozen team of most expensive lawyers. Aslam said he was glad that a landmark case against the taxi giant has been won twice and although Uber has appealed against the original decision but he is “confident” that judges will rule in favour of Uber drivers. Yaseen and James Farrar, who are the founders of United Private Hire Drivers which is the UK’s largest trade union for drivers, first brought case against Uber to the employment tribunal in 2015 and won where the judge ruled that Uber drivers, part of the so-called gig economy, are not self-employed and should be granted basic employment rights such as being paid the national minimum wage and getting holiday pay. The first tribunal trial was in July 2016 and verdict was announced in October 2016. Uber appealed to EAT and trial was conducted in September 2017 and got in verdict Nov 2017. Uber then appealed to the Supreme Court in December 2017 which was rejected in January 2018. Now a date has been set at the Court of Appeal in October 2018. The taxi giant appealed the tribunal decision and took the case to Employment Appeal Tribunal decision where Yaseen Aslam and his colleague meaning the case could end up in the Supreme Court next year but Yaseen Aslam and his colleagues are confident that it’s too late for the Uber. Following the verdict Uber appealed to the Supreme Court to hear this case but the Supreme Court rejected Uber’s request, and sent it back to court of appeal. Court of appeal has issued a date for 30 October 2018 for the trial. Uber has told the court that it could deprive riders of the “personal flexibility they value”. It claims that the majority of its drivers prefer their existing employment status but the Independent Workers’ Union of Great Britain (IWGB), which backed the appeal, said drivers will still be able to enjoy the freedoms of self-employment – such as flexibility in choosing shifts – even if they have worker status. Yaseen Aslam said it is time for the Mayor of London, Transport for London and the government to step up and use their leverage to defend worker rights rather than turn a blind eye to sweatshop conditions. Yaseen Aslam said he was willing to fight the case all the way to the Supreme Court if necessary. He said the two legal victories are good for workers and the judge has confirmed twice that Uber is unlawfully denying our rights. Yaseen Aslam got so entangled in his legal fight with Uber that he was hounded by the giant and he had to even approach the police. Fed up with the Uber, he quit his job and now works as an IT consultant for the Ministry of Defence. He divides his week between working for the Defence Ministry and dedicating himself to the union activities, leading private hire drivers in activism against the Transport for London and Uber, demanding rights for private hire drivers. “We have won because of union and unity and I will continue to be a unionist for myself and others. We have a duty towards others,” said a resolute Yaseen Aslam.